The Patagonia Primo Down Men’s Jacket was their top of the line shell until the Patagonia Pow Slayer arrived. If you want to buy one jacket and not have another one for as long as you can stand it then this is a great alternative to Arcteryx and other high-end jackets that only cater to skiers. You see more skiers wearing Patagonia jackets but the company doesn’t ignore us snowboarders and you even see pics of snowboarders in their catalog. 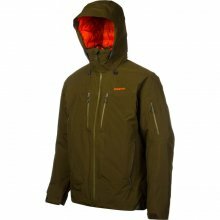 In the past, Primo used a laminate on the outer layer called H2NO but the 2012 and above Primo Jackets use Gore-Tex making those the better choice. Fit: Felt like a similar fit to the Pow Slayer which is not as baggy as many Patagonia Snowboarding jackets I’ve tried. It’s a good fit but it also has enough room for layering up. Construction: top-notch construction. It’s not going to wear out quickly and there is a great warranty to back it up. Hood: If I had my choice of the 2 high-end jackets in their line I’d go with the Pow Slayer because it has an articulating hood. Not everyone agrees with me on this and many like articulating hoods but for some reason, Articulating hoods usually leave some small part of my face exposed and it doesn’t contour around my goggles. Insulation/Warmth: None to speak of. This is all about blocking wind and water so the layers you choose to wear under will do their job. Waterproofing: 3 Layer Gore-Tex really gets the job done and it’s pretty bomb proof. Breathability: Gore-Tex is really good for waterproofing but not quite there compared to some of the competitors when it comes to breathability. Still, this is higher end Gore-Tex that does a really good job at pushing out moisture. Overall: Yeah Patagonia isn’t the first choice for snowboard clothing but hell they make clothes that last forever. Patagonia is the only clothing company that is closest to zero environmental impact in the action sports industry. Supporting them is like investing long-term in the snow we ride. We try to get as many images of the Patagonia Primo Down Men's Jacket, but forgive us if they're not all there.